Lauren J. Sharkey is a Korean American writer from Long Island, New York. 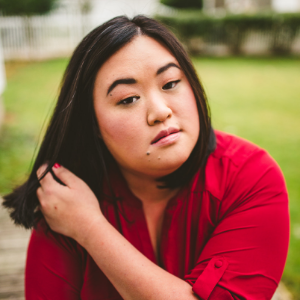 Her creative nonfiction has appeared, or is forthcoming, in Dear Adoption,, Blind Faith Books‘s I AM STRENGTH Collection, the Asian American Feminist Collective‘s digital storytelling project FIRST TIMES, and others. Sharkey graduated with an A.A. in Liberal Arts from Nassau Community College, and holds a B.A. in Multidisciplinary Studies from SUNY Stony Brook. Sharkey also holds an M.F.A. in Creative Writing and Literature. At the age of three months, Lauren was adopted by Irish Catholic parents, and her experience was the foundation for her forthcoming novel, INCONVENIENT DAUGHTER. “I think the market has been dominated by stories where adopted children reunite with their biological families and suddenly feel whole. There are other adoption narratives that need to be told, and I think INCONVENIENT DAUGHTER brings to the forefront a story we haven’t heard before,” says Sharkey.